I love smoked ribs or BBQ ribs, it’s just always a Caveman staple, but they can be a little work, especially if you want them to turn out tender and fall off the bone. I got a little lazy last weekend, we were out at a local street fair and when I got home I just didn’t feel like putting in the work so I decided to braise the ribs, kind of a set it and forget it, for those of you who know what I am talking about. 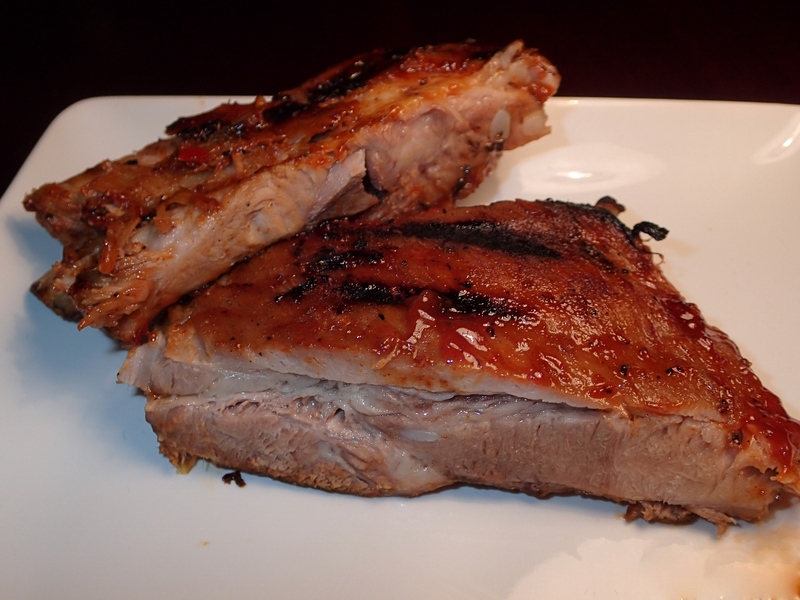 It’s a great way to really get those ribs tender and impose some flavors into them. Braising alone just wouldn’t cut it for this caveman, I still had to fire up the grill so after they were braised I slathered on a BBQ sauce and gave them a nice crust before serving them. I all this my lazy ribs. 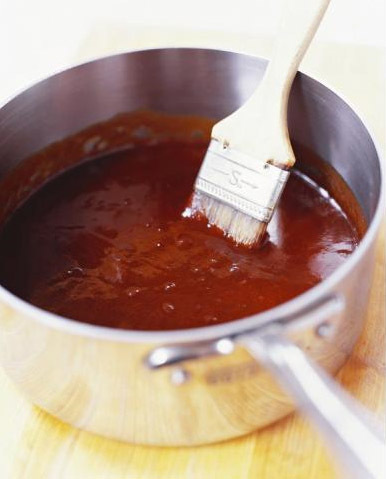 Sweet and Spicy BBQ Sauce: Combine all the ingredients in to a small sauce pan and then heat under low until warm and well blended. Give it a taste and if it’s what you are looking for let it sit until you are ready. I like to use those disposable aluminum pans for this part of it, easy to use and no cleaning involved. If you have a braising pan more power to you. Combine all the braising ingredients in a pan with the ribs and cover them. Put them in the oven and let them cook for about 3-4 hours. Caveman Tip*** If you let them go too long in the oven they will just shred as you pull them from the pan and you will not be able to put them on the grill for that great BBQ flavor. Preheat your grill: I like to turn all the burners on high and get that grill smoking hot. You want to crisp up the outside not cook the ribs. Caveman Tip*** You can obtain that same crust on the outside of the ribs by using your broiler if you don’t want to use the BBQ. 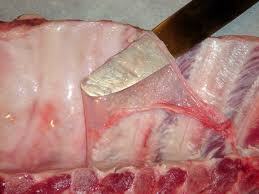 Check the ribs, they should be nice and tender but not disintegrate when you pull them from the pan. At this point you will want to let them slightly cool on the outside so you can handle them. Pat them dry with a paper towel and then liberally coat them with the BBQ sauce. Once your BBQ is good and hot, put them on the grill for a minute or two per side until you get that caramelization from the BBQ sauce and you are ready to go. Slice them up and enjoy. BBQ Sauce: Combine all the ingredients into a small sauce pan and heat on low for 5-10 minutes until the ingredients are well blended. Let it cool until you are ready to use. 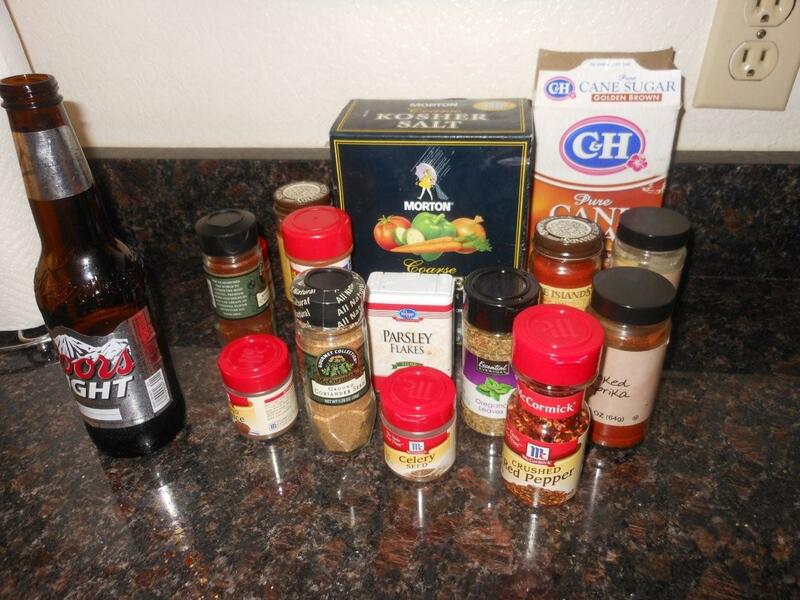 Pork Marinade (Italian Dressing): Combine all the ingredients and mix well. 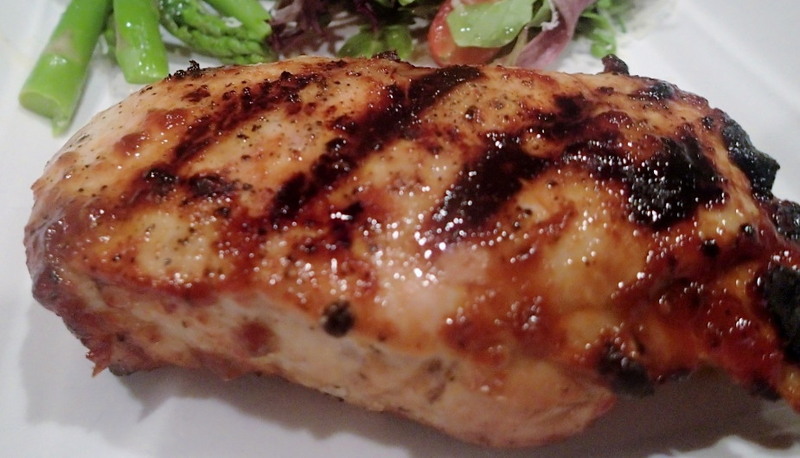 Use half for the marinade and reserve the other half for the salad by covering well and storing in the fridge. 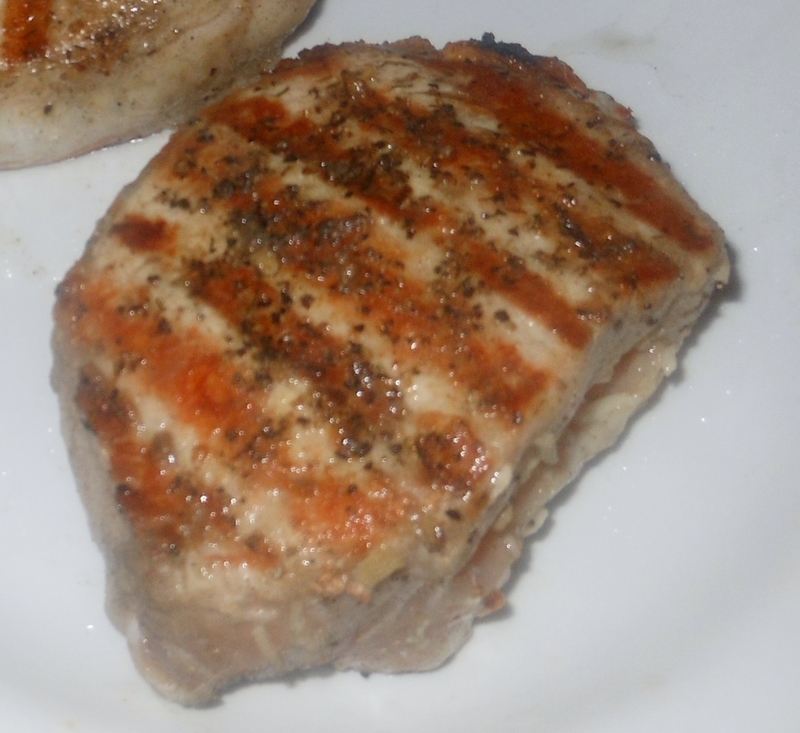 Preheat your grill: First make sure you clean the grates and then oil so that the chops will not stick. Turn your grill up to full temp, close the lid and let it get hot for about 10 minutes. While your grill is getting hot pull the pork out of the marinade and pat it dry. Now liberally coat it with the BBQ sauce and let it sit until your grill is ready. When you grill is good and hot, the temp gage should read 700 degrees or better, place your pork on the grill directly over the heat source. Close the lid and let the pork site for 2 minutes and then turn them 90 degrees and close the lid again. This should leave those great grill marks you are looking for. After 2 more minutes flip the chops over close the lid and let them sit on the grill for 2 minutes. 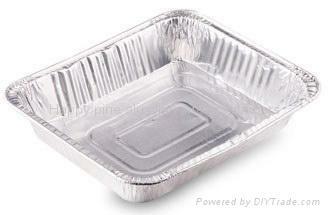 After the two minutes is up rotate them 90 degrees and close the lid. You will want them to sit another (you guessed it) 2 minutes. At this point you will want to temp your chops depending on the thickness they may be done. You are looking for 145 degrees. If they are ready pull them and let them rest, if not put them on the top rack and turn your burners to low. You will continue to cook until you reach 145 degrees, it should not take long. 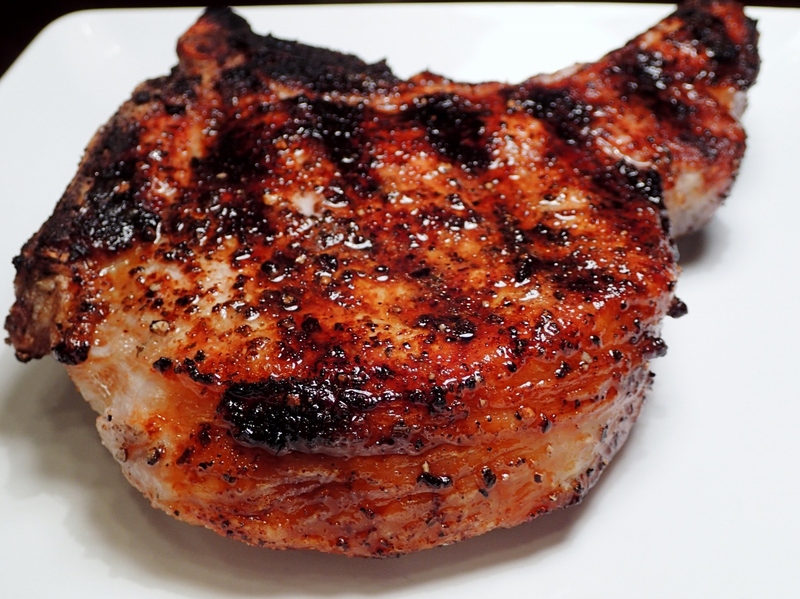 Let the chops rest for 5 minutes or so and serve them with your favorite sides. I just so happened to make a bitter salad and asparagus. When we are on trips where I am making dinners, I like to buy ingredients that I can use with multiple dishes. My cheesy potato au gratin dish goes well with this because they use the same ingredients. We also opted for burgers one night using the bacon, swiss, and jalapenos. Start off by sautéing the jalapeno and onion in a light amount of olive oil until soft. Combine parmesan, swiss, bacon, onions and jalapeno mixture in a bowl. 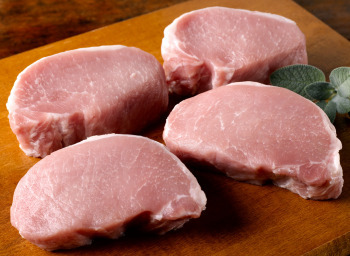 Create a pocket in your pork chops by thinly slicing ¾ of the way through the chop. 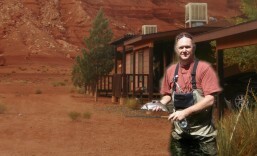 (see picture) Unfortunately for us – our rental place at Marble Canyon Lodge did not have any good knives…so caveman had to clean his fly fishing knife and use that. Spread your sliced chops open and stuff a good amount of the stuffing mixture inside. Repeat for all chops. 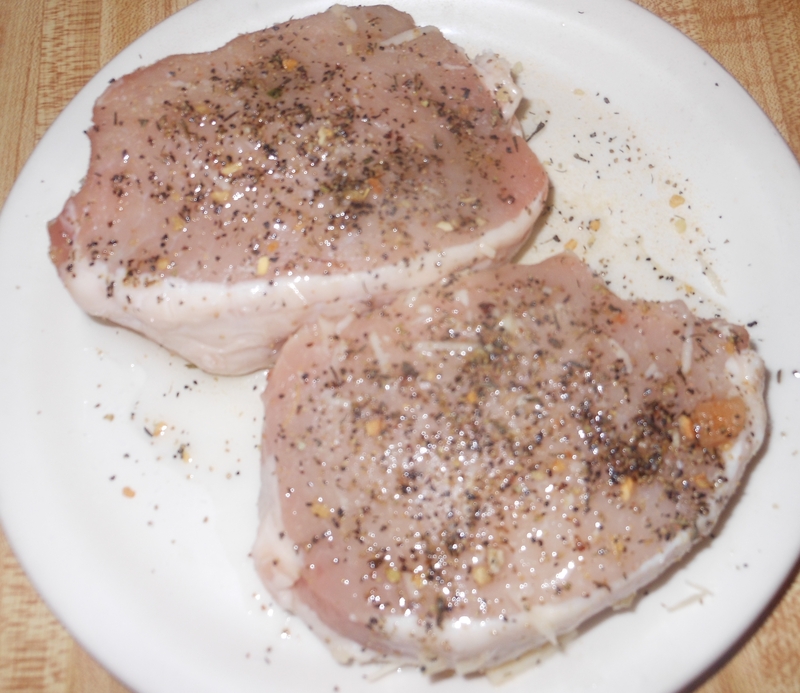 Once they are stuffed, season the exterior of the pork chops with extra virgin olive oil, salt and pepper, and top with marjoram and garlic powder. You can store them in the fridge until ready to grill. 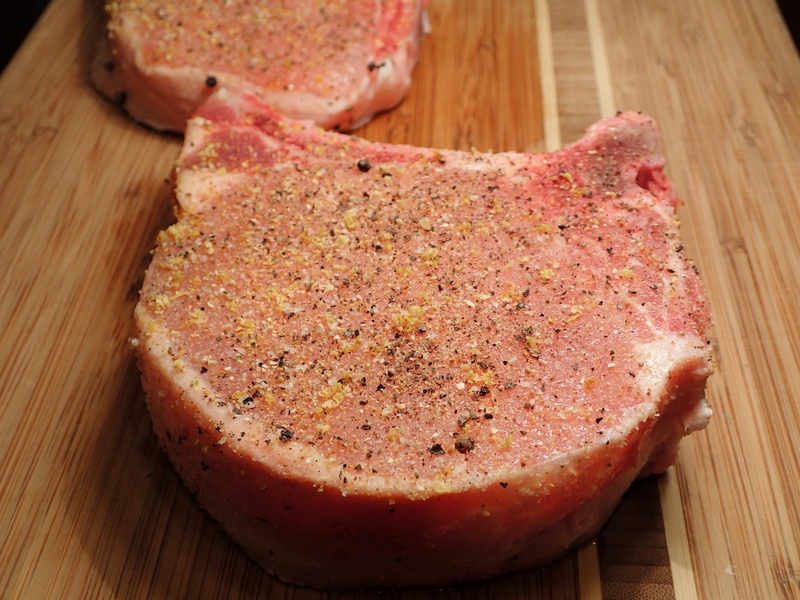 The chops won’t take long to cook because you have basically have turned them into two smaller chops by opening up the middle. I always have my quick read thermometer with me so just check the temp. and pull them when they ready. I like to remove them from the grill at 150 degrees, cover them and then let them rest for at least 5 minutes. This allows the pork to finish cooking without drying out. 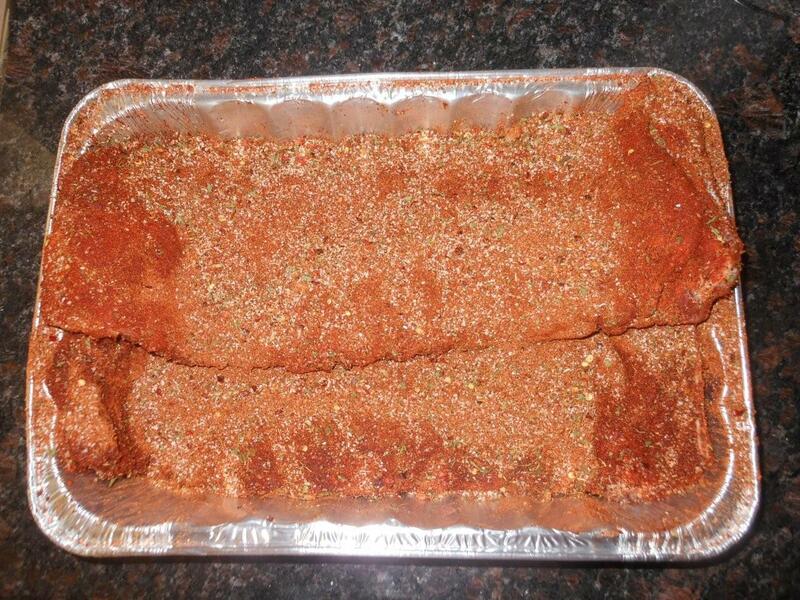 The purpose of the Memphis rib rub is to give the ribs flavor without coating them in sauce. By coating the ribs in a rub and letting them rest overnight – the strong flavors can penetrate the meat – making it a mouth-watering experience your friends & family will never forget! Combine all the above ingredients and mix well, store in airtight container until ready to use. You can always double the ingredients, and store it for next time! 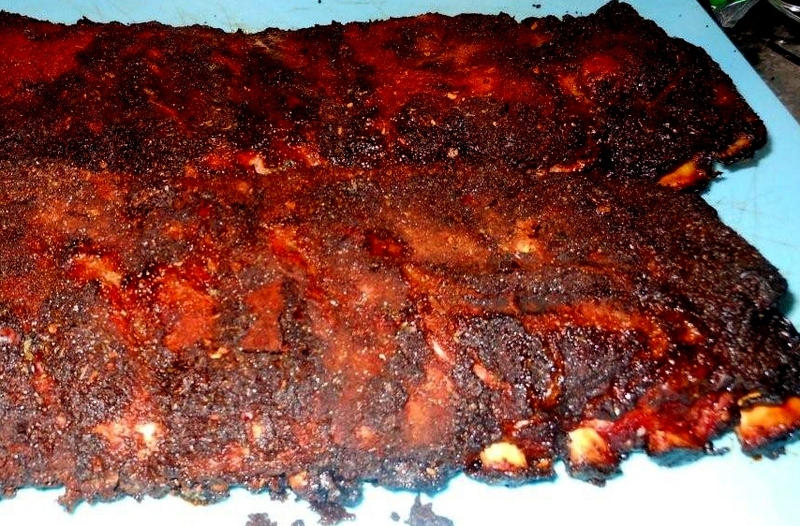 RIB MOP –What’s this for, and why do I need to make it if I have BBQ sauce? 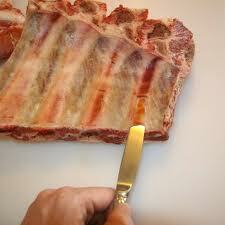 The mop will help the rub penetrate the meat and stop the ribs from drying out during the long cooking process. Combine all ingredients and stir well, refrigerate until ready to use. You will need to use a good basting brush to mop the liquid onto the ribs. Combine all ingredients cover and store in refrigerator until ready to use. 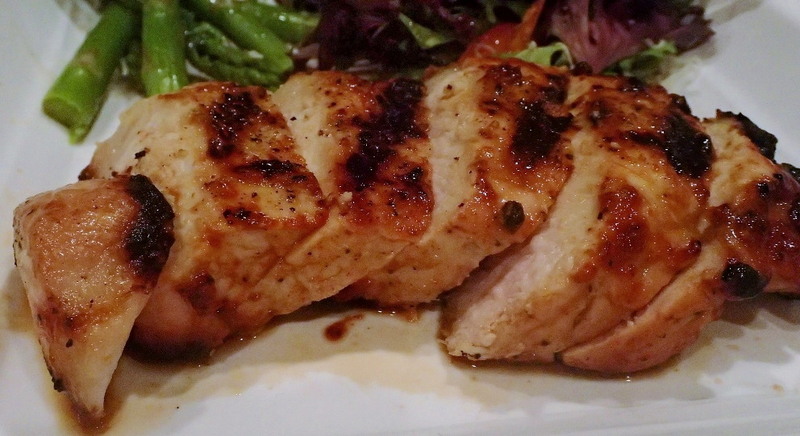 Time to start the grill…. I prefer a slow hickory smoke when making ribs, but there are a number of options when grilling. Get the BBQ ready. I prefer charcoal but gas BBQ’s will work. They are easier to set a temperature but in my opinion, the smoke pouches don’t work as well. 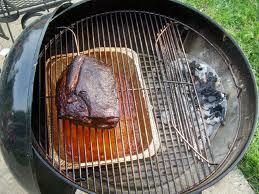 I also prefer to use the indirect heat method along with a water bath under the ribs. It sounds harder than it is! Simply have the heat source off to the side and put a tin of water or liquid directly under the ribs. This allows steam from the water bath to penetrate the ribs and help keep them moist. If you want to get really adventurous add flavor to the water bath. Apple chunks or any kind of aromatic ingredient (onions, celery, etc). The BBQ should heat up to about 225⁰F to let the ribs cook thoroughly. 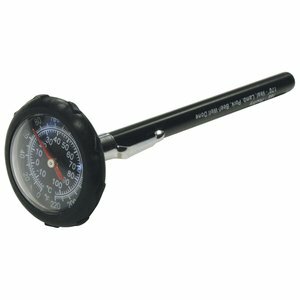 If your BBQ doesn’t have a temperature gauge, get yourself a good BBQ (Oven) thermometer. They can be purchased at most grocery stores for a few bucks. 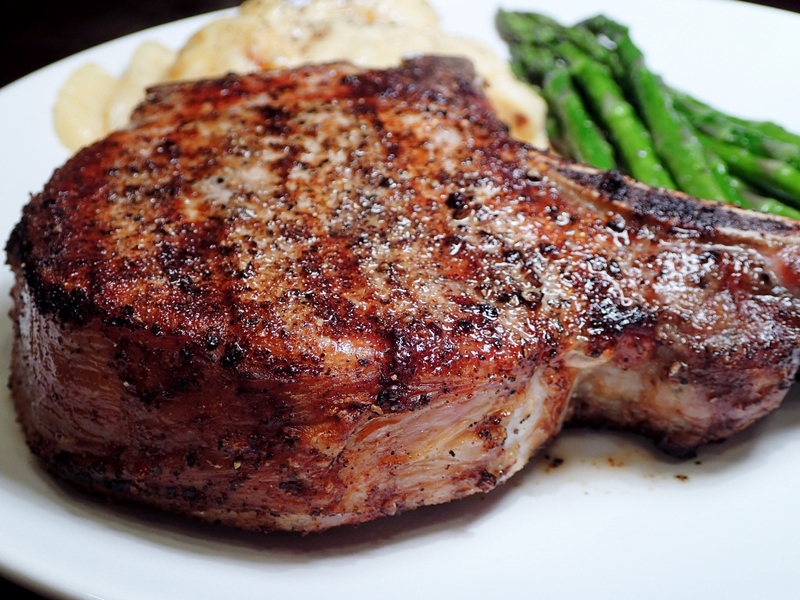 While the grill is heating up…. 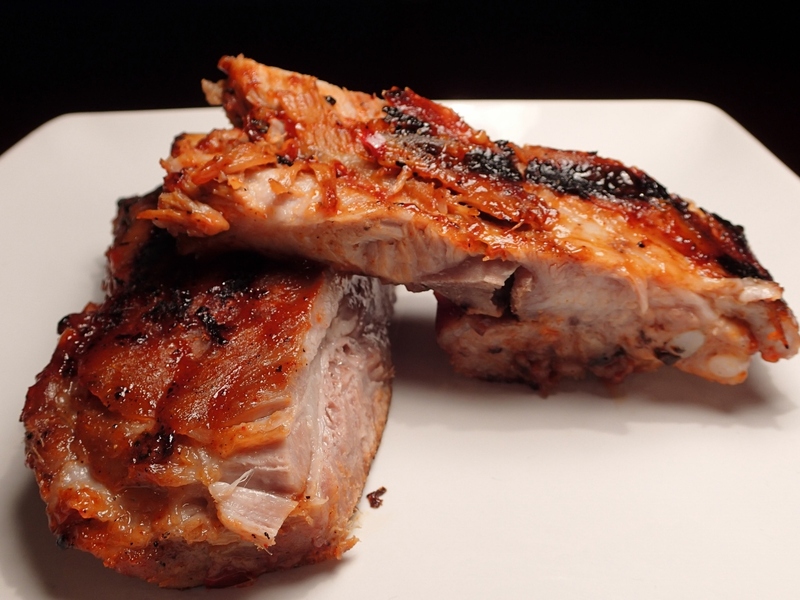 Pull the ribs from the fridge before you put them on the grill so they can come up to room temperature. Keep the BBQ about 225⁰F and put ribs on, bone side down. They need to cook for 4-6 hours * Be sure to check coals or temp every now and again. I like to baste the ribs with the mopping liquid at least once an hour. Do not turn the ribs over! Let them cook bone side down the entire time. Pouring your mopping liquid on the ribs every hour will allow the vinegar and beer to help break down the meat and keep it tender. 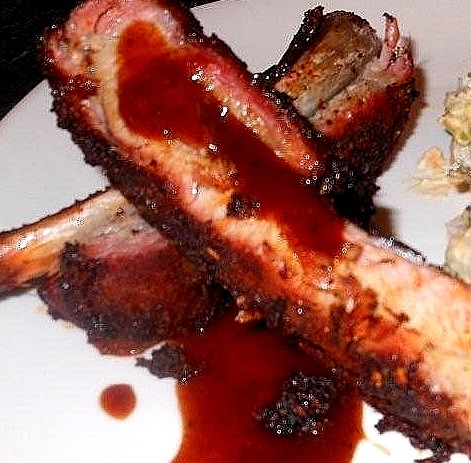 The longer you cook the ribs, the more tender and mouth-watering they will be. You be the judge. Now, I prefer the Memphis Style Ribs dry, and having the BBQ sauce on the side. This allows everyone to enjoy ribs as they choose, BBQ sauce or not! For those that want the sauce, warm it up on a medium heat prior to serving. If you prefer a wet rib, just pull the water bath, stoke up the flames, coat the ribs with the sauce and give them a few minutes on each side for the sauce to caramelize and thicken up on the exterior of the rib.